Swimming around Burgh Island with a huge hangover is not a particularly good idea. Still, it never stopped me before and it didn't today. 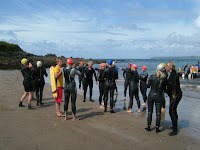 We were a large group, as we were joined by the Outdoor Swimming Society. The waves were, ahem, challenging, and although most of the group made it round, I took advantage of a kind offer by the lifeguards of a lift in their boat towards the end. Note to self; future circumnavigation of the Island requires both a flat sea and a clear head. 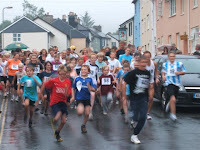 Running three miles around Ashburton may not be everybody's idea of fun; nevertheless the Fun Run is an integral part of carnival week festivities. This three mile sprint/jog/walk/stagger is usually accompanied by storms and flooding; this year wasn't too bad, just an intense drizzle of rain which helped keep us cool at least.